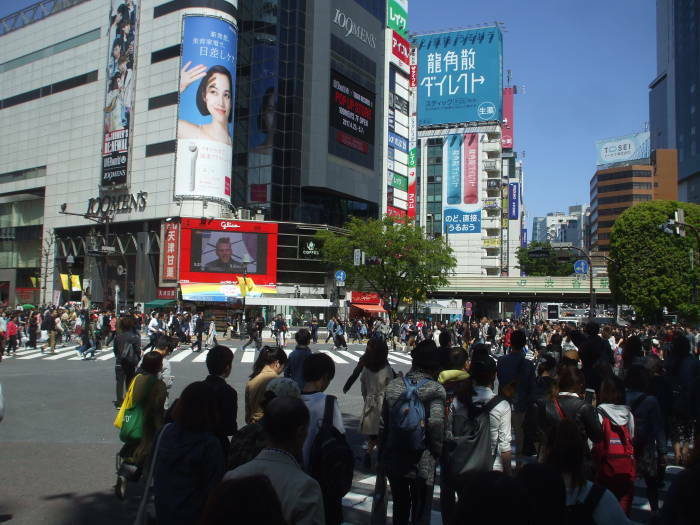 Shibuya is a major business center with one of the busiest railway stations in the world. 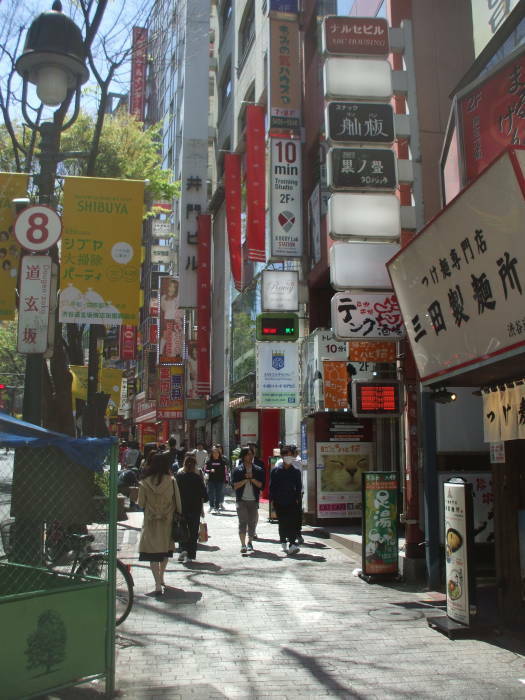 Shibuya is a special ward of Tōkyō, reaching north to include parts of Shinjuku. 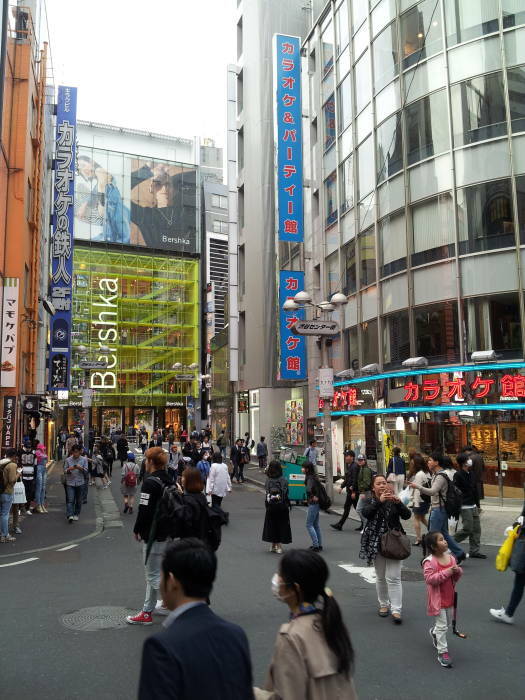 But when most people say "Shibuya" they mean the shopping district around Shibuya Station. 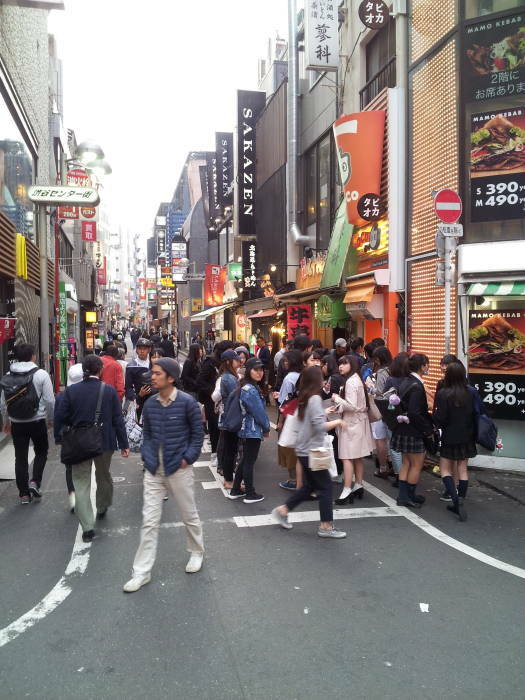 This is a major nightlife area and, along with the nearby Harajuku, one of the top fashion centers in Japan. 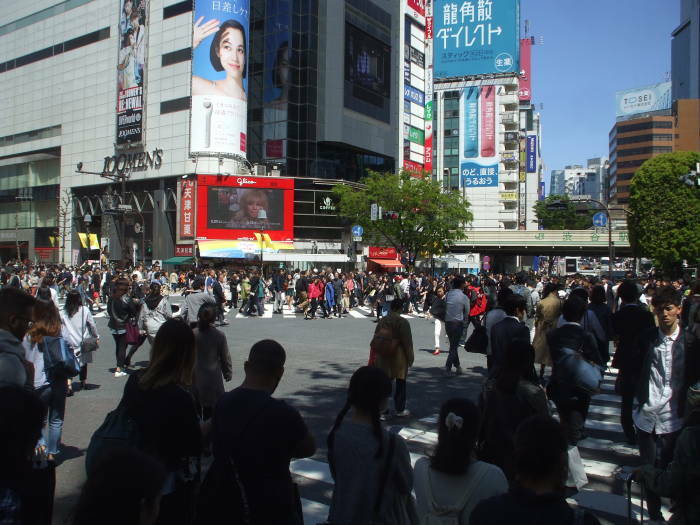 The Yamanote Line that passes through Shibuya Station on its loop around central Tōkyō started operation in 1885. 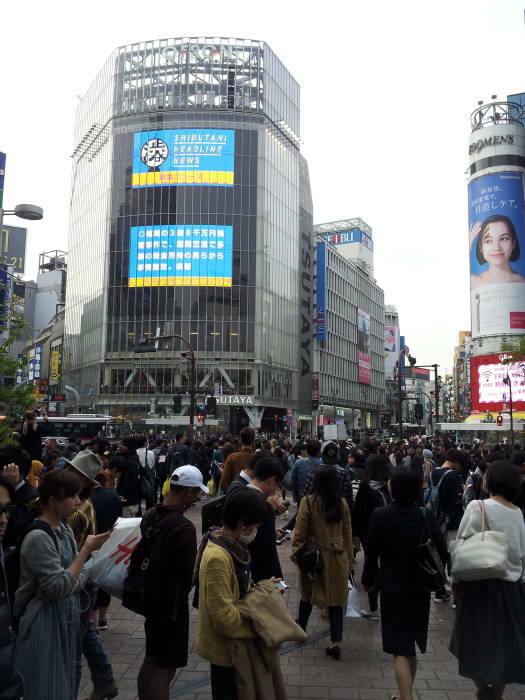 Shibuya quickly became a major railway terminal for the southwestern part of the city. 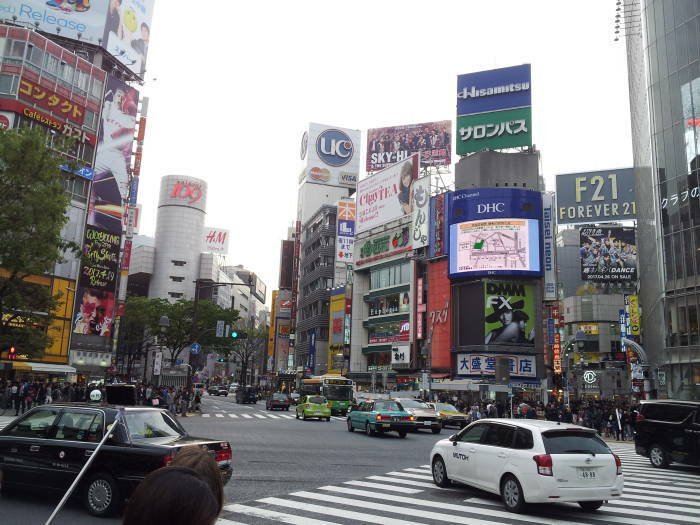 Shibuya was incorporated as a village in 1889 through the merger of three villages. 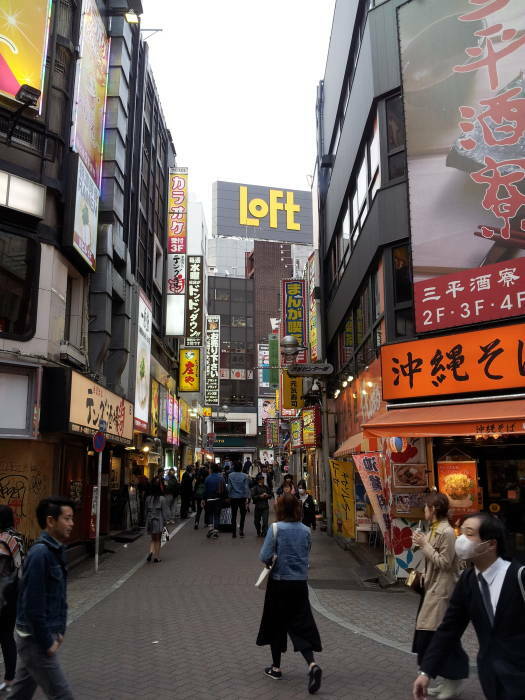 It became classified as a town in 1909, and then merged with neighboring towns to become Shibuya Ward of Tōkyō in 1932. It then grew in importance when further rail and subway lines were opened through the 1930s. 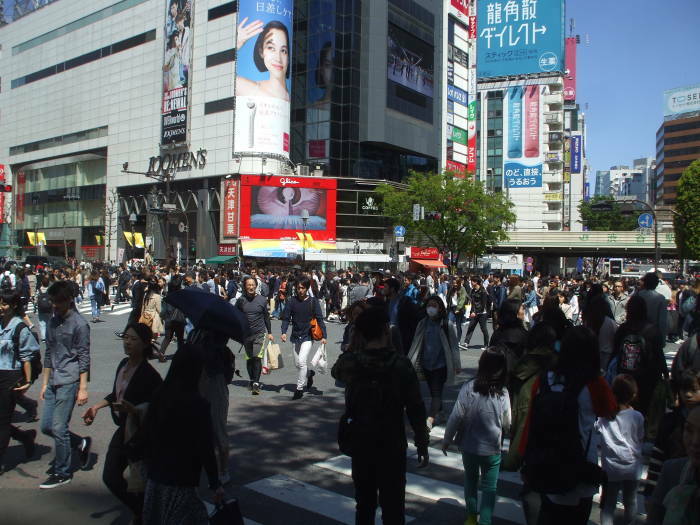 Shibuya became a center of commerce, entertainment, and especially since the early 1980s, fashion. 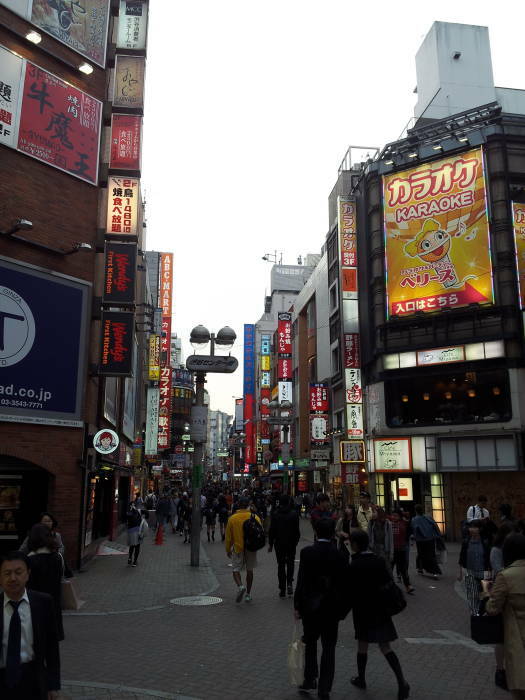 In the late 1990s it became the center of the information technology industry in Japan. 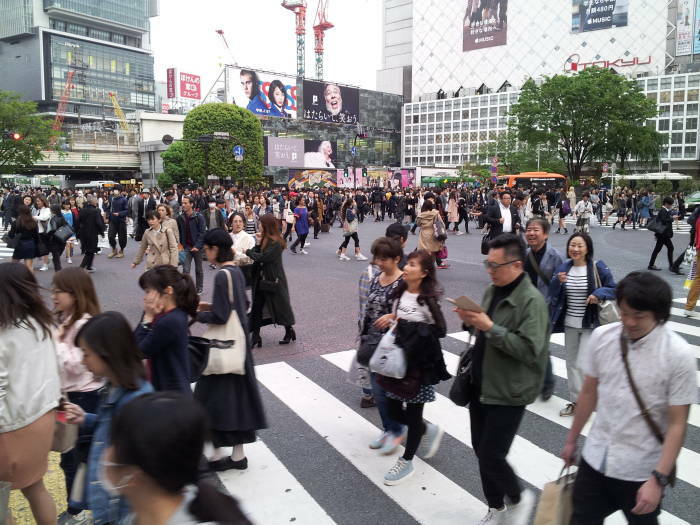 You might arrive at Shibuya Station by the elevated Yamanote Line or other railway lines operated by JR East, Keio, and Tokyu; or via the underground Ginza Line, Hanzōmon Line, or Fukutoshin Line of the Tōkyō Metro. 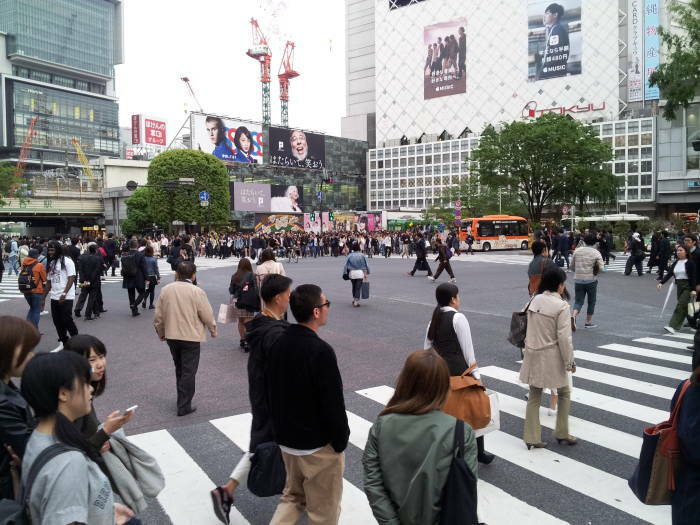 Over 2.4 million passengers come through the station on a typical weekday. 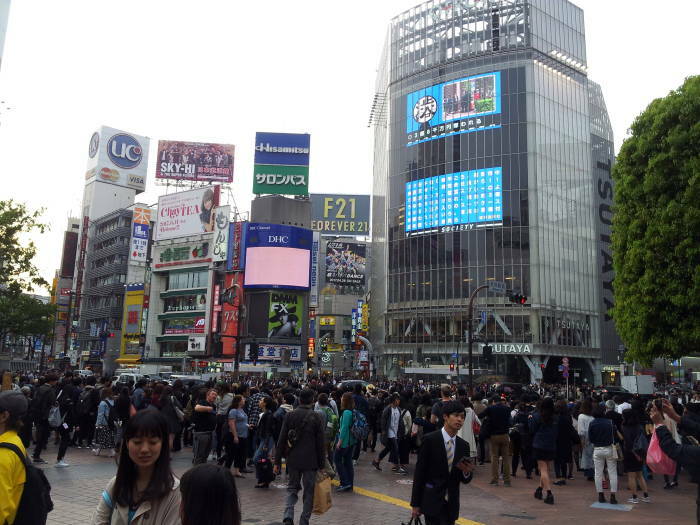 It is the fourth-busiest commuter rail station in Japan and the world, after Shinjuku, Ikebukuro, and Ōsaka Umeda. 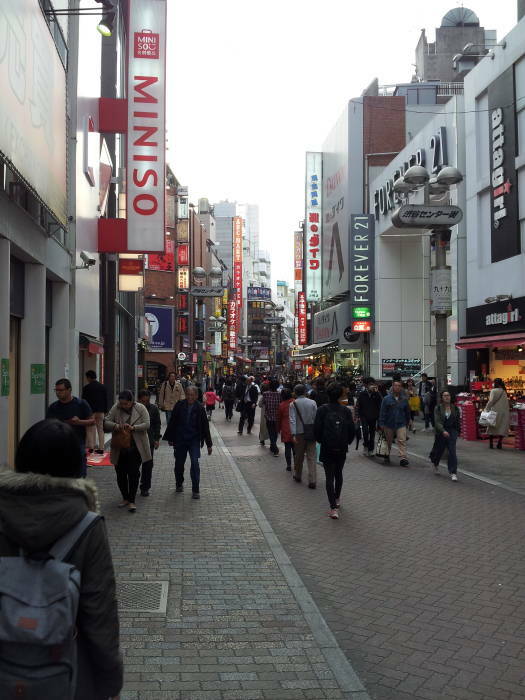 Or, you might be walking south from the Harajuku area as I am in the first picture below. 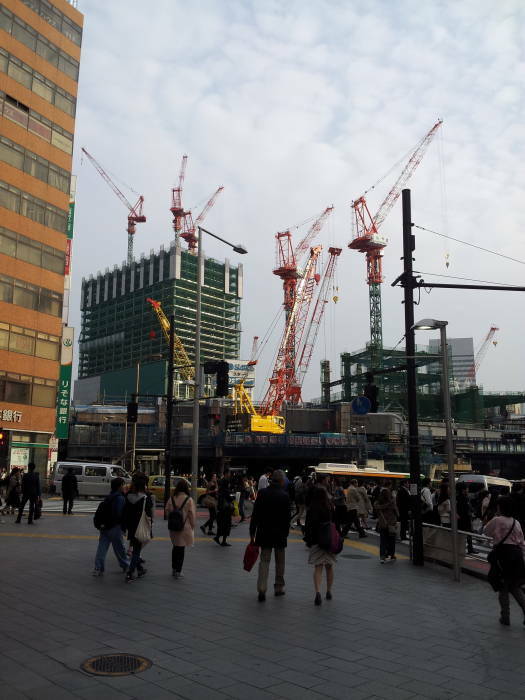 Shibuya is densely built up, and they're adding more. 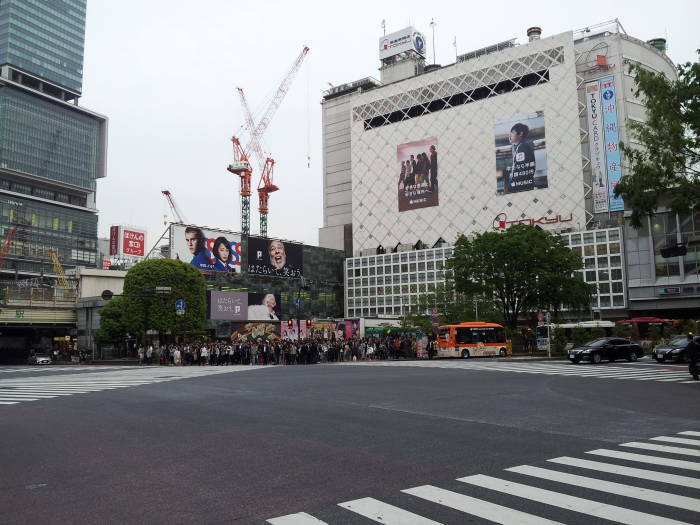 I have arrived at the Shibuya Crossing. 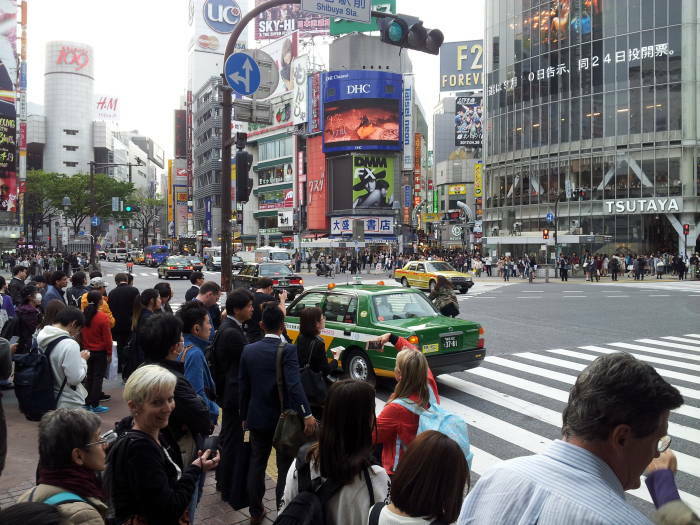 The traffic signals stop traffic in all directions, and people can cross in any direction for a limited time. Lighted advertising signs and large video panels overlook the crossing. 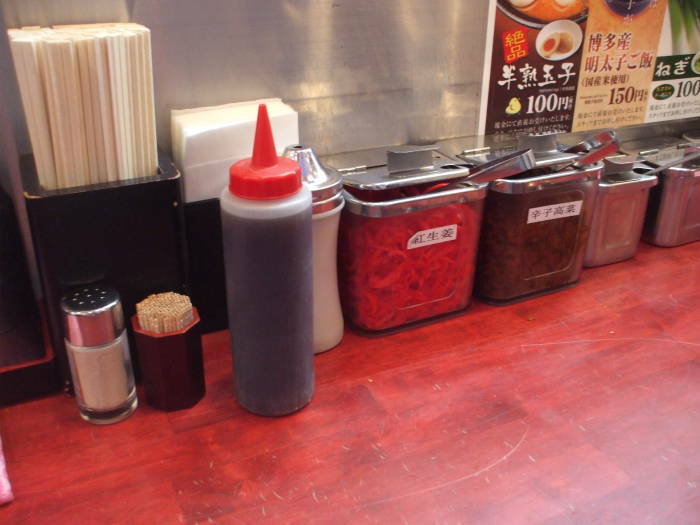 It's an iconic sight, distinctive of Tōkyō. It's sort of like Times Square in New York, or Picadilly Circus in London. But it's not as tacky or strictly touristic as those. 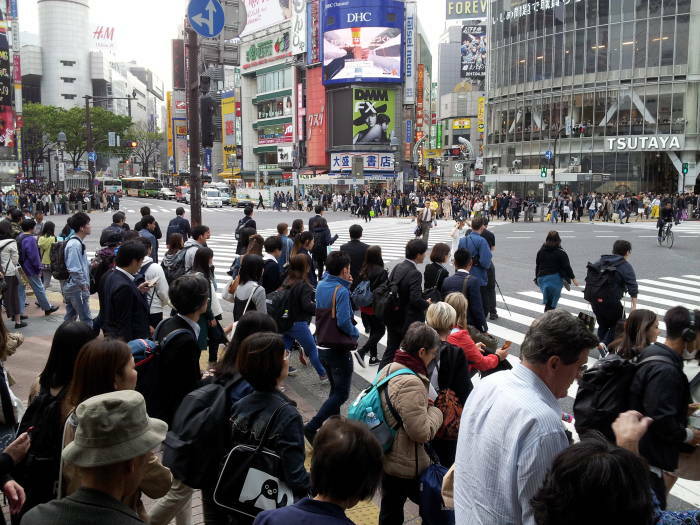 And with this being Japan, pedestrians get out of of the intersection before the lights change and traffic flows again. I will explore some of the side streets. Here is the view from the other side. 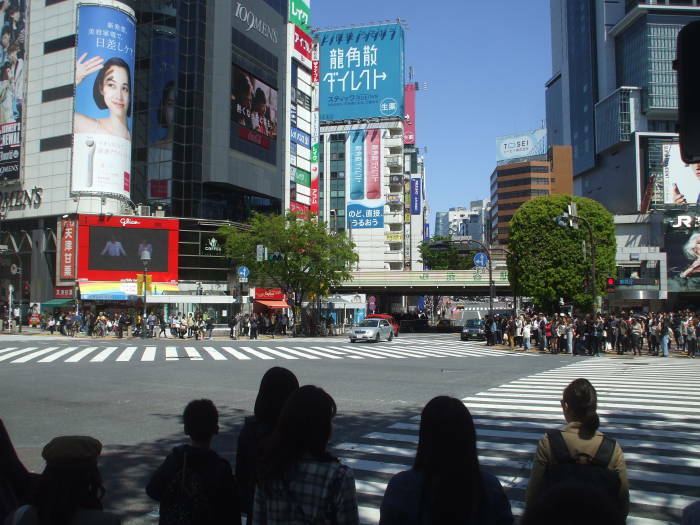 We're looking south toward Shibuya Station, in the right half of these views. 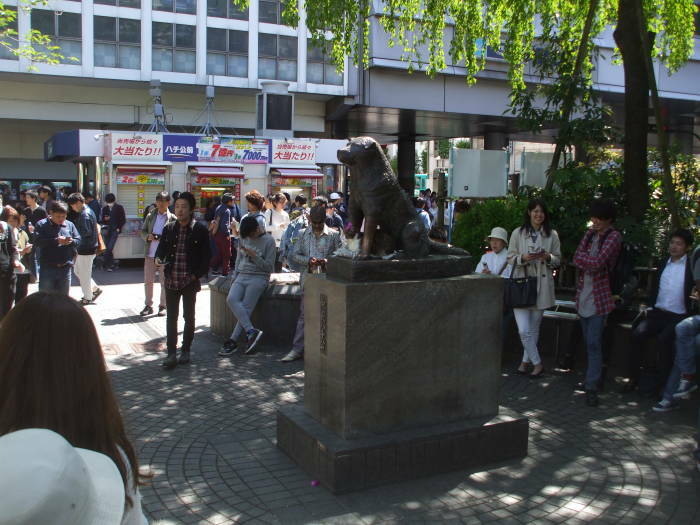 Hachikō was Japan's most famous dog. He's known as Chūken Hachikō or "Faithful Hachikō". He was a golden-brown Akita from a farm in Akita Prefecture. Hachikō's owner was Ueno Hidesaburō, a professor of agriculture at the University of Tōkyō. He studied and taught topics in the field of arable land readjustment and reclamation. Ueno took the train to work, and every day, Hachikō would go from the house to Shibuya Station to wait for his master's return. This started when Hachikō was about six months old. In May 1925, after a year of their daily commuting routine, Professor Ueno suffered a cerebral hemorrhage while giving a lecture. He was taken to the hospital, where he died. Hachikō continued to go to the station to wait for Ueno to return. He would arrive every day right at the time the professor's train would have arrived. 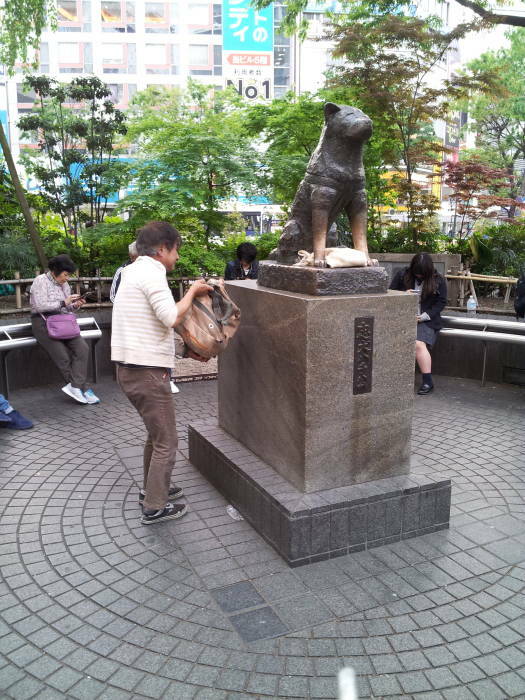 Other commuters recognized Hachikō as the dog they had regularly seen greeting his owner at the end of the day. Hirokichi Saitoe, one of Professor Ueno's students, saw Hachikō at the station. He followed Hachikō back to the home of Ueno's former gardener. Saitoe researched the Akita breed. He discovered that only 30 purebred Akitas remained in Japan, including Hachikō. He published a number of articles on the Akita breed, starting with the well-documented census of the remaining 30 purebreed Akitas in Japan. Several articles focused on Hachikō's loyalty. One of the articles was widely read after it appeared in the Asahi Shimbun in October 1932. Hachikō became a national hero. 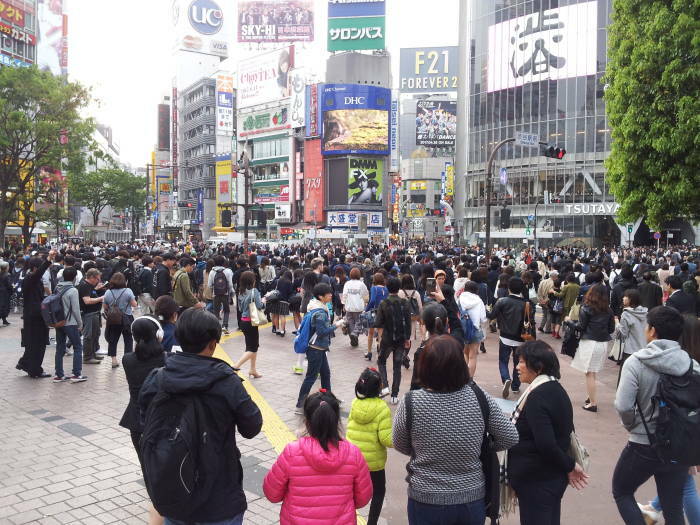 People began to bring food to Hachikō. Teachers and parents began to cite Hachikō's example to children. He grew into a national symbol of loyalty. Hachikō died in March 1935 at the age of 11. He was cremated, as most Japanese citizens are, and his ashes were interred in Aoyama Cemetery beside Professor Ueno's. 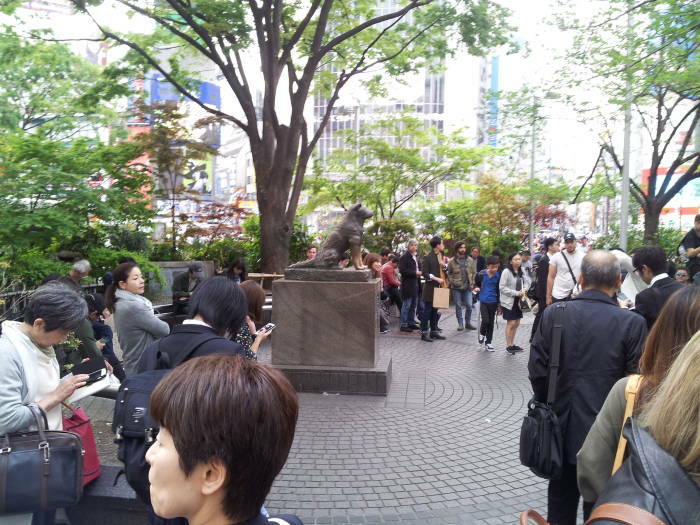 An artist had created a bronze statue of him, and Hachikō was there when the statue was unveiled and installed at Shibuya Station. The statue was recycled for war material during World War II. In 1948 the Society for Recreating the Hachikō Statue commissioned the son of the original artist to create a replacement. 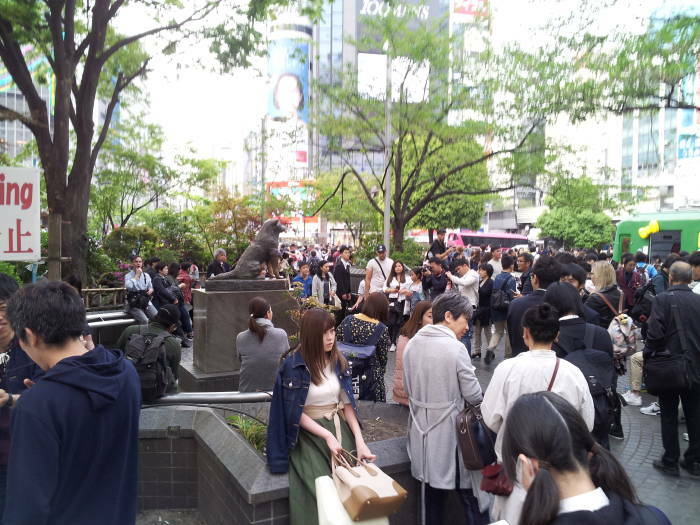 The statue is the popular meeting spot for all of Tōkyō. 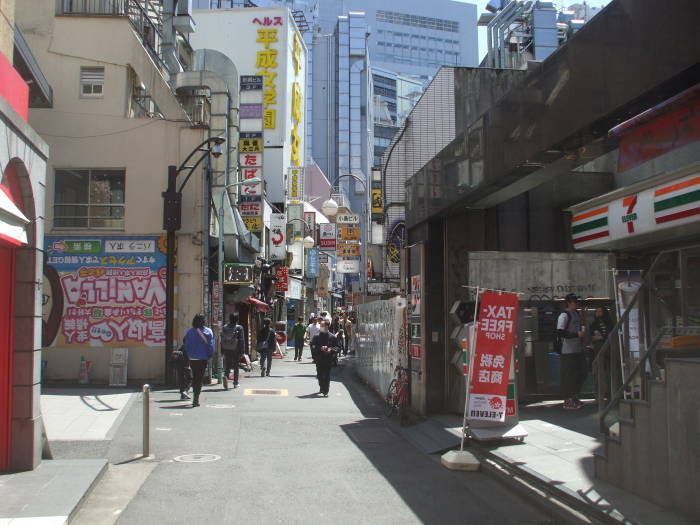 The nearby dooreway of the Shibuya Station is the Hachikō Entrance/Exit. 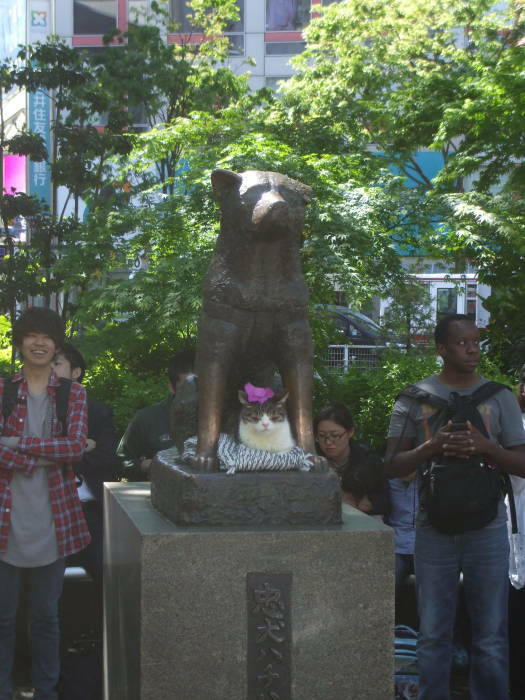 A statue of a remarkably loyal dog is nice. Maybe even a little kawaii, or cute. But to be really kawaii, you need to have a cat there, lying sleepily on a pillow. But to be even more kawaii, truly over-the-top cute, the cat needs a flower. And so, the Hachikō-flower-cat-pillow ultra-kawaii stack. Stories of dogs remarkably loyal to their owners go back at least to Homer's story of Argos. As for Japan, the Nihon Shoki or Chronicles of Japan was one of a pair of books commissioned by the Emperor back in the early 700s CE. These were the first attempts to record Japanese history. These chronicles begin with events occurring before the creation of the world. They maintain an entirely mythological view throughout their description of the early godlike and later heroic human figures. They connect the origin of the Imperial line with the deities before the creation of the world. The mythic Emperor Jimmu was described as a child of the creator gods, with the genealogy placing him somewhere around 600 BCE. The two documents listed Emperors from Jimmu to within a few decades of when they were written down. So, the Nihon Shoki, written down in 720 CE, and the Kojiki or Records of Ancient Matters, written down in 711-712 CE, aren't rigorous history any more than Homer's Illiad and Odyssey are. However, the Nihon Shoki describes a warrior from the reign of Emperor Sushun-Tennō, the 32nd Emperor reigning 587-592 CE. In that period the Emperors named by the records quite possibly existed, as opposed to the first 15 that even strict literalists concede are purely mythical. Anyway, the Nihon Shoki reports that the possibly legendary warrior of that possibly legendary Emperor was killed in battle. His loyal dog then starved to death, laying close to his master's grave on an ancient burial mound. 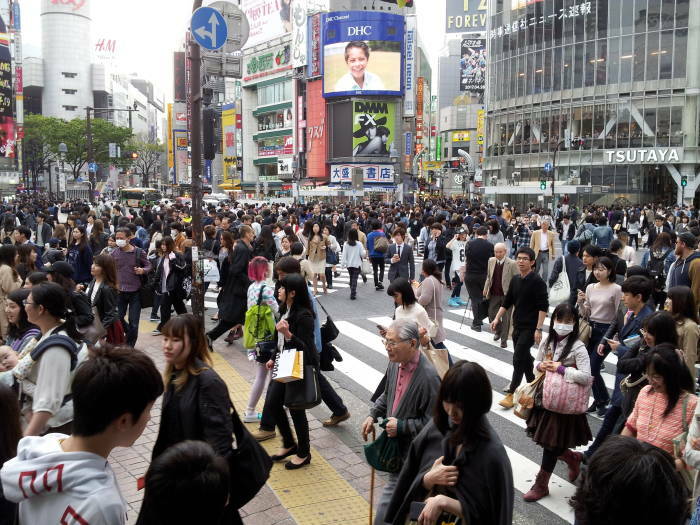 Let's get lunch in the Shibuya area on another day. 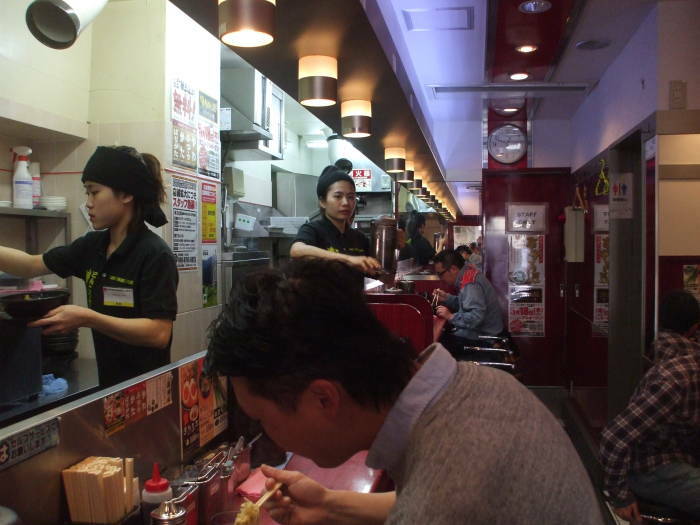 A small restaurant near Shibuya Crossing is one of the few places where you can eat whale meat. Japan operates what they call a "scientific research fleet". The scientific research seems to consist of verifying that explosive harpoons still kill whales the way they have so far. Whaling is to Japan much the same as what coal mining is to the U.S. state of West Virginia. It's part of their self-identity. They become angry if outsiders complain that it's a harmful activity, as those outsiders are criticizing an almost sacred tradition. However, working on a whaling ship, like working in a coal mine, is difficult labor in an unpleasant and dangerous setting. Of course the whaling and the coal mining must continue to keep the tradition alive. Just don't ask the average person you encounter to have anything to do with it. The "scientifically investigated" dead whales mostly go to waste, as there isn't much market at all for the meat. 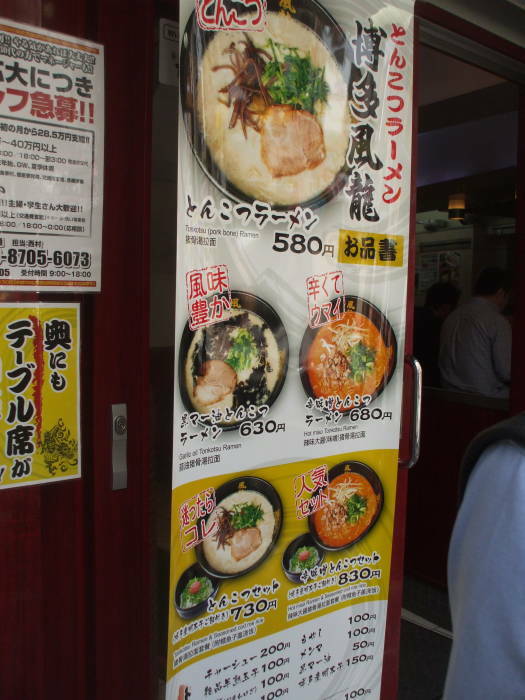 But if you want to track it down, a restaurant in the Shibuya area is one of the few places that offer it. 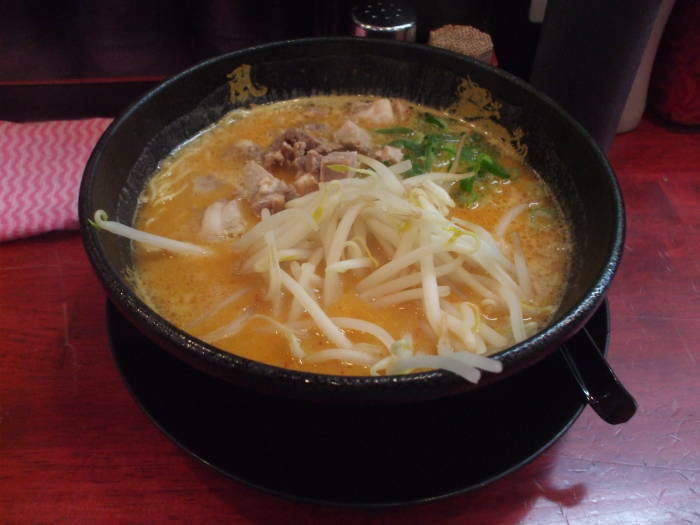 So, I'm looking for non-whale ramen. It's much easier to find. The poster shows what's available and what it costs. 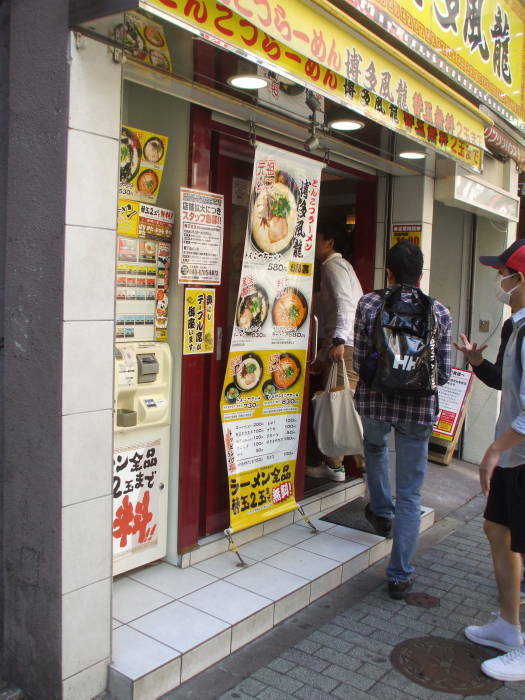 As is common at ramen shops, you purchase your meal at the machine outside. 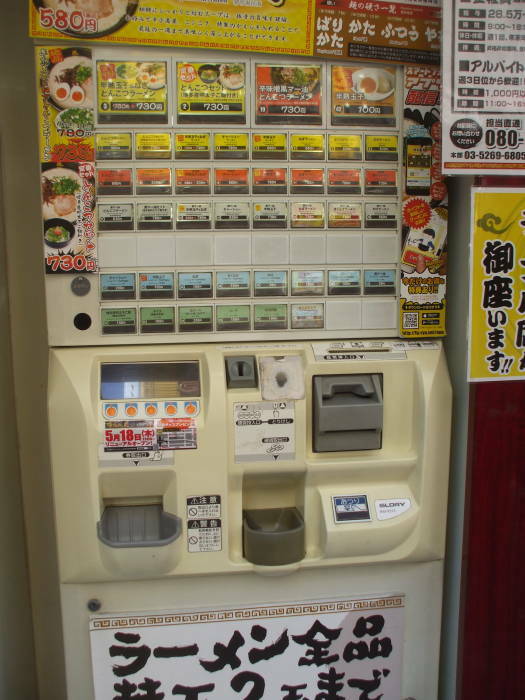 You use the descriptions and pictures to find what you want in the array of buttons on the machine. You press the button, insert money, and get a ticket. Go in, find a seat, and give your ticket to the staff. 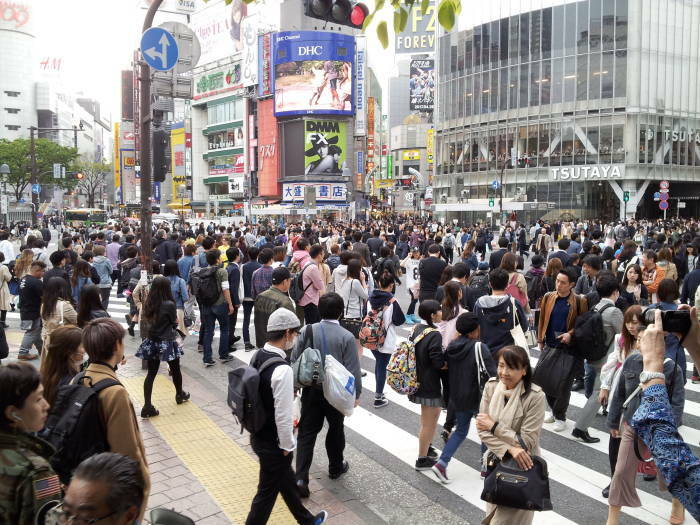 And now, back down to Shibuya Crossing. I'm looking across the intersection toward the northeast. Here come the last vehicles for this cycle. Now the lights have changed, the vehicles have stopped, and the pedestrians are crossing. 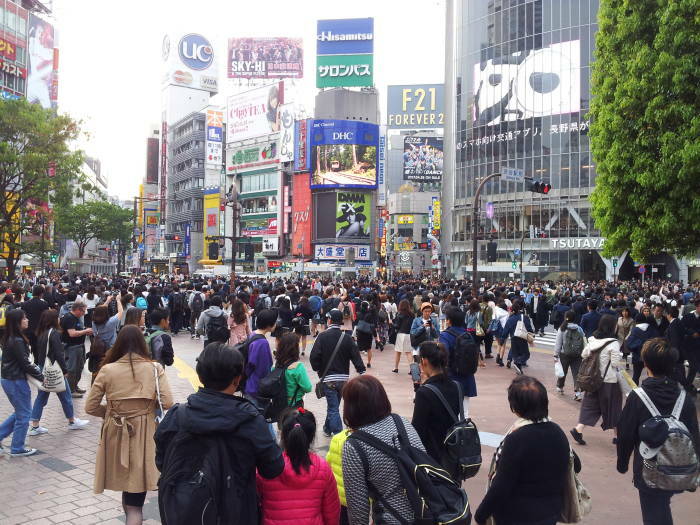 Here is a hypnotizing live feed of Shibuya Crossing. One hostel where I stayed in the Asakusa area of Tōkyō had a bar and lounge area downstairs. A large TV panel displayed this constantly.